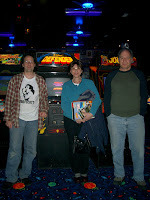 Yesterday Luna City Arcade was visited by Susan England, who from the mid-'70s until 1981 ran an arcade called "Silver Sue" in Chicago, home to such industry giants as Bally, Gottlieb, and Williams. Sue, her husband, my wife, and I all sat down for a nice chat about the good old days. Sue shared many vintage photos of and magazine articles about the arcade she ran, and she told me a few stories about the various classic game programmers and other celebs from back in the day. She has promised me some scans of the arcade photos, and I'll share those here when I have them. Thanks for taking the time to visit Sue! It was really fun having you out to talk shop! I was very honored the other day to get a visit from Jason Scott. 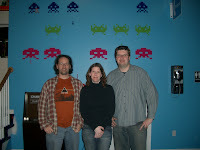 Jason, who runs the website ASCII and who I respect a great deal, made a trip out here to see the arcade. 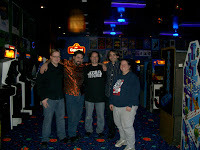 From left to right, that's Dan Moniz (one of Jason's buddies), Jason Scott, me, Nick DePetrillo (another of Jason's buddies), and my wife Julie. Be sure to check out Jason's blog post about the visit as well as an album of photos he took while here! - "Face to Face with Luna City"
Kotaku.com added another article about me. This one links to the DigitalLifestyle.tv interview. 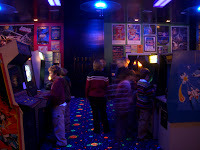 "Video Tour of the Luna City Arcade"
Here's a couple more radio interviews with me. The first one is about 20 minutes long and the second one is about 5 minutes long. 97X FM: "Dwyer & Michaels in the Morning: Interview with Peter Hirschberg"
KNIX Country: "Ben & Matt: Interview with Peter Hirschberg"
I also added these to the "Press" web page on my Luna City Arcade site. A friend of my neighbor Fred donated this retro TV set to me. It makes a perfect television set for our Atari 2600! As promised, here's the video I took when we had all the Cub Scouts out for a Game Day party last week. Refer to my previous post. Make sure you watch for the cute little "victory dance" a couple of the kids do near the end of the video. 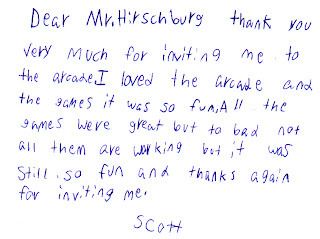 I also received a really sweet Thank You letter in the mail from one of the kids, and another from one of the parents. Here's the video interview that DigitalLifestyle.tv did with me a couple weeks ago. On Saturday, a crew from The Digital Lifestyle, a 24-hour online video network dedicated to technology news, rumors, and lifestyle, did a video interview with me. I'll let you know whenever the video is online! Here is a picture of me with the 2 people from the show that came out. My nephew had a party in the arcade today to celebrate graduating from cub scouts to boy scouts. He invited his entire den, and I think they each brought their entire families. It was pretty busy! 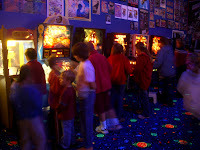 Not as much as it was on Game Day I don't think, but with so many kids the gameroom was rather well-loved today. I shot some video but I need to buy another firewire cord before I can upload it. For now, here's a couple photos of the cub-scoutin' action. I've created a new website for the arcade, lunacityarcade.com. I moved all the arcade-specific content from my personal website to there. I still have to rework my personal website now to point to lunacity.com. Here's something of a weekend wrap-up for some links to articles that I haven't posted yet. VH1 Game Break: "What A Home Arcade Room!" 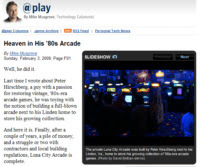 Switched.com: "Working Stiff Builds 1980s-Style Arcade On the Side"
Retro Thing: "Peter Hirschberg's Private Arcade"
Wired News: (radio interview) "A child from the 80's grows up and builds his dream arcade"
"The 2400 square-foot private arcade"
"Good: Collecting 65 classic arcade games. Great: Building a private 2,400 square foot arcade with black lights and 80's soundtrack. Awesome: Your kids leave it alone because they want to play Wii"
The comments are pretty funny. If you don't know who Wil is, go here. Wil, email me dammit! I contacted you a while back about my gameroom and you didn't reply. "Retro Arcade Gaming Fan Heaven"
It was previously on Digg back in 2006 when the collection was still in my basement. "Retro Arcade Gaming Fan Heaven Is Worth Infinite Quarters"
"Pretty Amazing Personal Arcade Collection"
The coolest part is all the comments at the bottom. The replacement speakers arrived to replace the 2 damaged ones I got before Christmas. Out of the 4 I got, all were damaged somewhat, but I decided to only exchange the 2 worst ones. One of the new speakers arrived fine. The other arrived like this. I'm not kidding. This isn't funny anymore guys! I also had to return the amp that I bought when it died after a couple weeks. I repeat - I am very disappointed with Pyle!!! New Washington Post article about my arcade! This was in today's Sunday Washington Post newspaper. It's also available online if you can't get a print copy! This article is somewhat of a follow-up to an article in the Post from 2006.